Scotland spurned independence in a historic referendum that threatened to rip the United Kingdom apart, sow financial turmoil and diminish Britain’s remaining global clout. A vote for the 307-year union is a relief for millions of Britons, including Prime Minister David Cameron, whose job was on the line, as well as allies across the world who were horrified at the prospect of the United Kingdom’s separation. With 31 of 32 constituencies declared, unionists had won 55 per cent of the vote while separatists were on 45 per cent. Unionists cheered, kissed and drank wine at a party in Glasgow, while nationalist leader Alex Salmond conceded defeat in front of an image of a giant white on blue Scottish flag in Edinburgh. “Scotland has by a majority decided not, at this stage, to become an independent country. I accept that verdict of the people and I call on all of Scotland to follow suit in accepting the democratic verdict of the people of Scotland,” Salmond said. Salmond laced his defeat with a warning to British politicians in London that they must respect their last minute promise of more powers for Scotland. “Scotland will expect these to be honoured in rapid course,” he said before walking off the stage. Sterling strengthened sharply against the dollar and the euro, while share prices looked set to open higher in a relief rally. The campaign for independence had galvanised this country of 5.3 million but also divided friends and families from the remote Scottish islands of the Atlantic to the tough city estates of Glasgow. Though the nationalists won Scotland’s biggest city, Glasgow, they failed to live up to opinion poll surveys before the vote which forecast that the United Kingdom’s fate was balanced on a knife edge. Polls showing a surge in separatist support over the past two weeks prompted Britain to promise more powers to Scotland, a step that has angered some English lawmakers in Westminster. “We have chosen unity over division, and positive change rather than needless separation,” said Alistair Darling, head of the “Better Together” campaign and a former British finance minister. Seeking to tap into a cocktail of historical rivalry, opposing political tastes and a perception that London has mismanaged Scotland, nationalists say Scots, not London, should rule Scotland to build a wealthier and fairer country. The vote prevents Salmond from winning his dream of an independent Scotland, a goal for which he has worked with a mix of shrewd calculation and nationalist passion for his entire adult life. Unionists had warned independence would usher in financial, economic and political uncertainty and diminish the UK’s standing in the world. They have warned that Scotland would not keep the pound as part of a formal currency union. Beyond the money and power, the referendum has provoked deep passions in Scotland, drawn in many voters who ignore traditional political campaigns and underscored what London politicians admit is a need for wider constitutional change. Scots were asked to answer “Yes” or “No” to the question: “Should Scotland be an independent country?”. 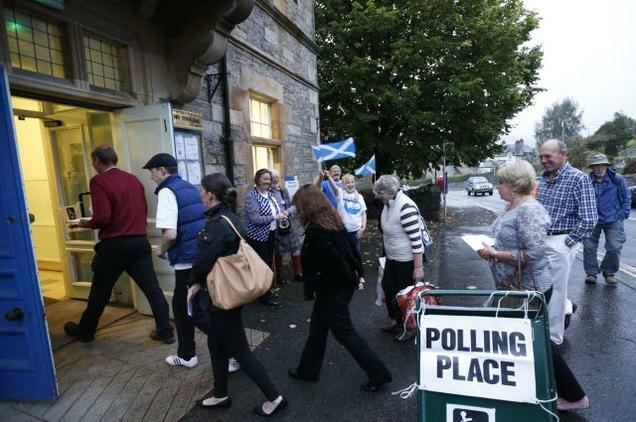 Voters lined up at polling stations across Scotland to vote with 4.28 million voters, or 97 per cent of the electorate, registered to vote. Turnout hit a record high. Cameron, who acknowledged his unpopularity in Scotland during the campaign, has drawn criticism for both putting the fate of the United Kingdom on the line and then rushing to promise more powers before the vote. The Prime Minister will speak shortly and Queen Elizabeth is also expected to put out a statement. Cameron was largely absent from the campaign, leaving former Prime Minister Gordon Brown to lead the unionist battle cry. The prospect of breaking up the world’s sixth-largest economy and a permanent member of the United Nations Security Council, has stoked concern in the United States and Europe, particularly in countries like Spain which face their own secessionist movement. Washington has made clear it wanted the United Kingdom, its main ally in Europe, to remain together.